I forgot to update you about my gel dip nails. Remember I told you I had cracked two? I was able to save the one, not the other and that's why I went nuts with the nail file a week ago. My nail lady and I decided that maybe those super long nails just aren't for me. I kind of already knew that, but I've never had long nails and I kind of wanted to see how long I could go. I do know I want them a bit longer than they are now. But the one I broke bad, now has a tip glued on it as it was so short. Overall, I am in love with this process. I just wish I didn't have to go every two weeks. It gets old-especially when I drive two hours for a one hour appointment. But that's on me as I live in the woods! Oh and get this? Diana's salon called Kim Nails was voted #1 salon where I live! How awesome is that? What's so awesome now? I'm getting a lot of new followers on Instagram and a lot of comments from people saying how pretty my nails are and how awesome my nail shape is. Part of me is very flattered, part of me is like hehehe, if only you knew my secret. Yet another part of me thinks if I ever give up the gel dip and go back to my nubs, that people will unfollow me and I'll be all sorts of sad! It's like a serious Catch 22. For now, the nails stay as they make me very happy. 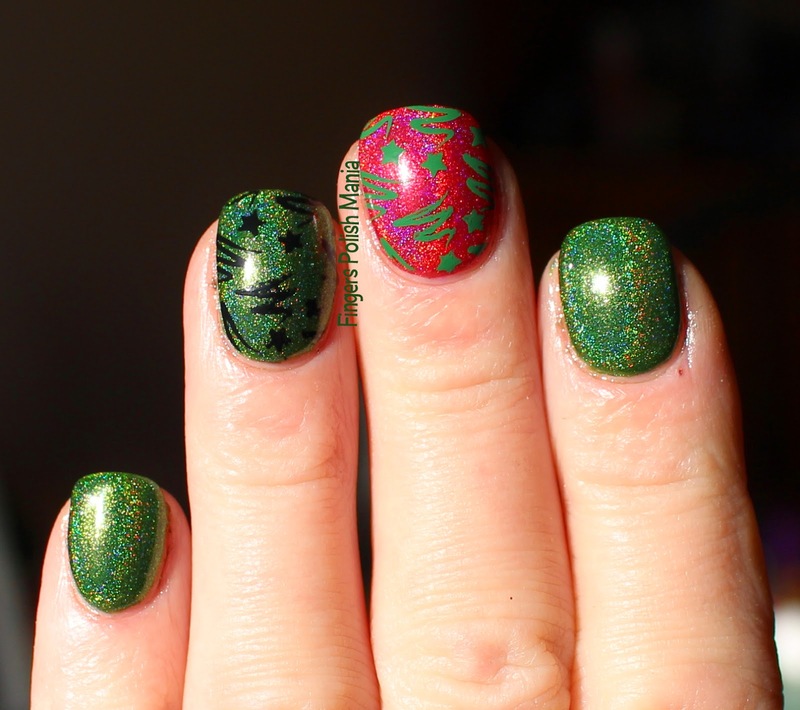 Today's mani is another Christmas one. I was just in the mood I guess. Usually, I don't get in the spirit until much closer to the day. 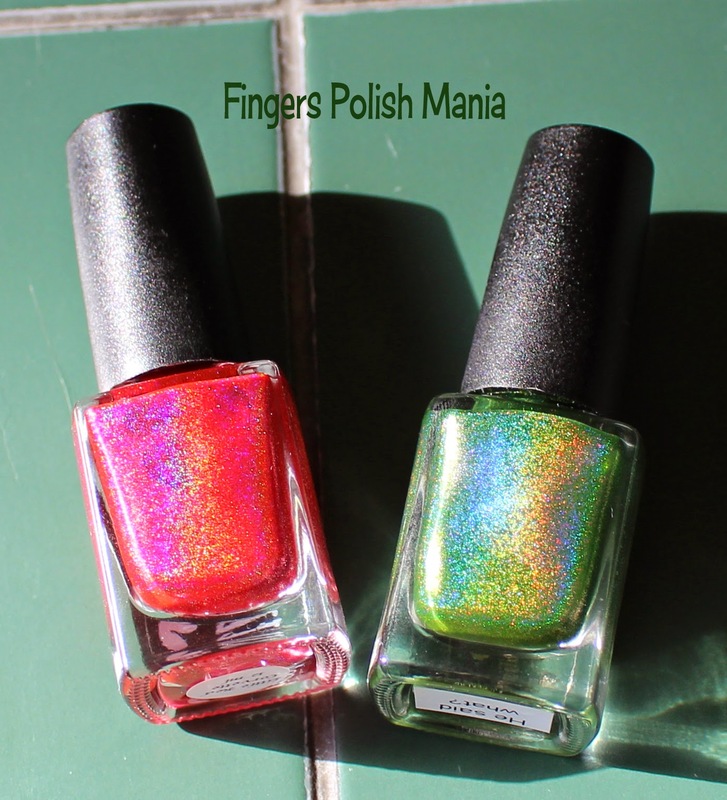 This is Colors by Llarowe Little Red Corvette and a custom for me holo called He Said What? Made by Cathy at More Nail Polish. It is not for sale, she made it just for me and sent it all the way from Australia! I started with He Said What and a weird accent of Corvette. I was going to do two red nails, but I loved this green so much, I changed my mind! Hence the weird accent nail! 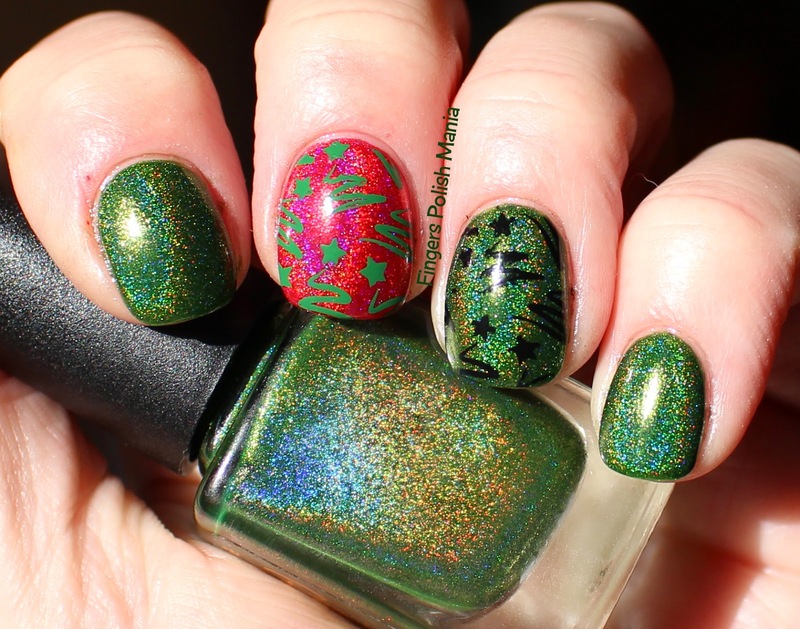 Isn't this a stunning green holo??? And so blingy! I love it! Didn't want to cover this up too much, so I used my Mundo de Unas Black and Military Green with Cheeky jumbo plate 6 Happy Holidays. We all know hind sight is 20/20. I think this would have been way better with all green and one accent using the black. 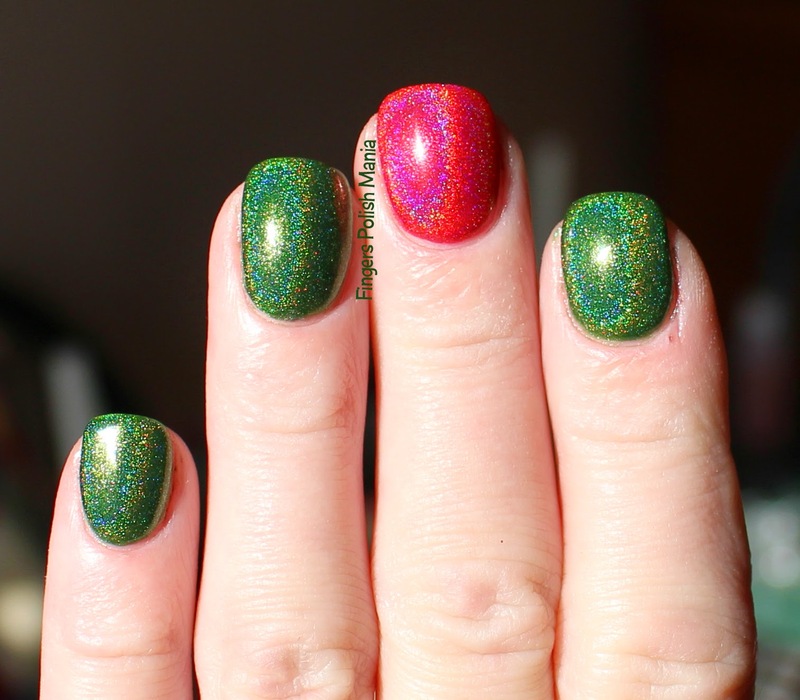 Or stamping the green with red, but I don't have a red Mundo yet! 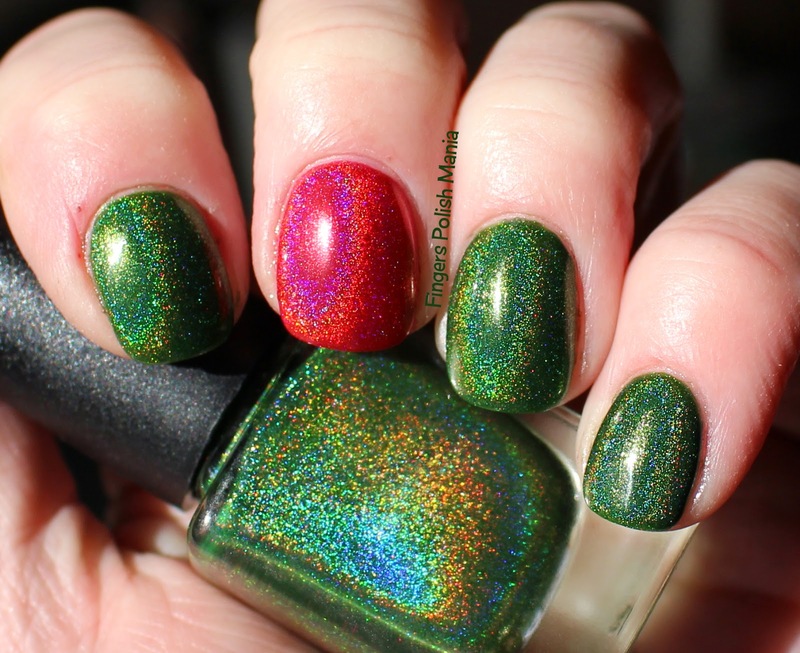 Anyway, these holos are gorgeous! And this green is to die for!